NE PA- Damascus/Tyler Hill - We renovated the kitchen and baths! We are bordering the Catskill Mountains, 20 minutes to the Bethel Arts Center, original Woodstock location and Resort World - on over 100 open and wooded acres on top of the mountain. Relax in the hot tub overlooking the amazing Delaware River and valley. There is a massive native stone fireplace in the family room and a free standing wood stove/fireplace in the living room. The home is near the river, lakes, streams, swimming pools, and a private stream-front area. 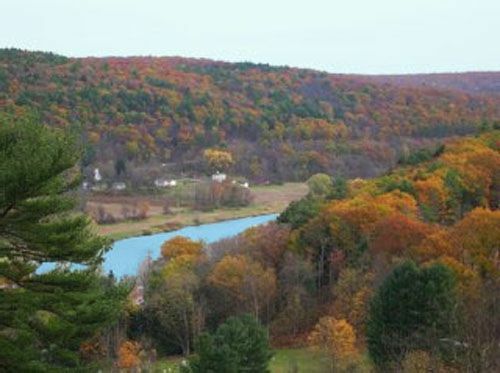 Located close to Monticello, Callicoon, Hawley, Beach Lake, Honesdale, and Scranton, it is near children's water parks, Big Bear and Elk Mountain skiing, arcades, shopping, antique stores, fine restaurants, hiking, rafting, boating, and many beautiful places to enjoy the views and country side in total peace and relaxation. Peace and Quiet While at Home: Located at the end of a mountain road, the house offers complete privacy, and unique tranquility. Hiking on the private acres provides for many hours of peace and tranquility. Hiking along the Delaware River offers another blend of tranquility and relaxation. Activities abound away from the house: The house is located near Skinners Falls, a water park, the Bethel Arts Center, golfing, skiing, art studios and the local artists tours in August. There are many antique stores and boutiques in the close neighboring towns. Restaurants abound in all price categories from 10 to 20 minutes from the property. A new washer and dryer is located in the laundry room in the lower level. The upstairs bathroom has access to the main hallway and to the master bedroom. There is a pancake grill for the stovetop and an electric waffle maker. Please bring your own systems, most guests have itunes so bring their own docking station. What I have is old in comparison. I use the Cable TV music stations. Pool table in family room. Twister! other board games as well! accessible from the yard through the front door, guests have already stayed there with no hassles. community pool $75 fee for entire stay unlimited access, playground, games room, and river access in Callicoon, near all shopping, . I request guests do not smoke in the house, rugs and furniture are steam cleaned frequently. I use EcoQuest's Fresh Air purifier to keep the house clean. Pets are considered if they are house broken and clean, protected with flea, tick and lice treatments. The house is clean and there is never pet odors. I have allergies and need it to be clean. There is central vacuuming so daily upkeep is easy. House has beautiful views and loved the fireplace and hottub. I hate to be critical because it was a really nice stay, however We had to run out and get firewood (but if you ask Roger he’ll get it for you before you arrive). There was a bad storm when we arrived and the power went out. So we were worried about heat and no firewood. There is no king size bed - twins pushed together. There was no room to park in the garage and the stairwell is a spiral staircase with little steps. The kitchen was very nice and had a new dishwasher. The bedroom has great views and was very comfortable. Although the house is outdated, we had an amazing time. Roger was very welcoming and was quick in answering all our questions. We would consider to rent this house again. Glad you enjoyed your time at the house. As I explained, I am updating the kitchen and bathrooms in January, Happy New Year! This house was beyond our expectations. The house was clean, private, and set up perfectly for what we were looking for. We brought our dog and were able to hike the mountain behind the house. The sunrise was beautiful in the morning being above the river. This house has everything you need for a perfect getaway. We are so happy we found this gem in rural PA. Roger is great and we will be returning. Wonderful house —with the best view! This big, wonderful, secluded house was perfect for our week-long disconnect. Between the hot tub, fireplace and truly one of a kind view, we got everything we were hoping for. The house was extremely well stocked, with everything we needed to be comfortable during our stay. We definitely recommend the home to anyone looking to get away and are looking forward to returning! The house was in a beautiful spot and we enjoyed the space it provided. Roger very quickly resolved the problems with the a wet carpet in the family room. It would have been helpful if previous occupants had told him about the leaking washing machine so he could have replaced it before we came. The hot tub was a real treat. As Roger has pointed out in his reply to the previous review, he will be renovating parts of the house in January as some of the areas are in need of an update. There were some items missing in the kitchen which previous occupants had not told Roger about. We made use of the fires and being together in a family space like this was really enjoyable. Our group of 8 stayed here as part of a birthday celebration that included a trip to Woodstock in Bethel, NY. We were very disappointed with the condition of the house. While the location was perfect for our travel plans and the view of the river was beautiful, the house needed much attention. The downstairs which looked beautiful in the pictures had a serious mold problem with visible growth on the pool table. The odor was so strong we did not use the downstairs at all during our stay. There was a de-humidifier running when we arrived and needed to be emptied several times during our stay. The owner did not leave any instructions regarding the operation of this. He did reach out to us when we arrived to alert us to issues with the hot tub, which he recently had serviced, however, it had not been cleaned so we did not use it. The house was advertised as having four bedrooms, but one of the "bedrooms" was behind a curtained crevice in a narrow opening with an air conditioner that leaked continually and left a big puddle on floor when in use. Bedroom doors did not close and downstairs bathroom door did not lock. Kitchen area had grimy cabinets, dirty dishes and tile back splash that was falling off the wall. Someone had placed rocks against it to keep it in place. Toaster did not work. Furniture was dated, and not the same as depicted in the online pictures. The house had a musty smell and the furniture had visible dirt on it. The screens in the windows were filthy and looked like they had never been cleaned. The deck furniture was again not as depicted in the photos and was dirty. The house needed a good cleaning inside and out. Visually the outside of the house did not look anything like the picture advertised. Its hard to believe the other reviewers rated this house so highly. Our standards are not out of reason, but this house was truly not a 5 star. We were unable to reach Roger during our stay and decided to make the best of it. When he did contact us late Monday evening, it was to say he got our messages but had been away. Happy that we got away for the weekend to explore this area but would not stay at this house again nor would recommend it. This house is falsely advertised, let this review be your guide. I am so sorry to read this review. I live a mile from the house and post both my cell and my home number on the side of the refrigerator right by the telephone to make it easier to contact me. I was home the entire time the guests were there. I am also available through email from Homeaway, Homeaway can also call me if a guest has a problem and contacts them. So I do not understand how I was not available, especially when I spoke to one of the guests a few times about resetting the circuit breaker for the hot tub. He did say there were pine needles that blew in when the repair man installed a new heater, there is net and vacuum which is used by guests if and when wind blows in leaves or pine needles while soaking and then need to skimmed out, this is normal in a country setting. I change the water each time a guest leaves so it is always clean. That said, I am so sorry they had an unpleasant time. It has rained so much in our river valley that I know all of our homes and motels have more moisture, including my own home, than what we are used to. I bought a dehumidifier for the downstairs to bolster the humidor I had installed a few years back. Until now we have not had a moisture problem and the dehumidifier appeared to solve this new issue. I have the house cleaned by a professional company and they did not state the issues that the guests complained of but said all homes they clean have more humidity than normal. The pool table cover is being replaced, it is old but not moldy. I do know people put their drinks on the felt which I wish they would not do, so there are few stains and few players tore the felt. I am aware of this and finally found a company in Scranton who is coming to install a new cover. I also have a major renovation taking place in January installing a new kitchen, updating bathrooms, and repainting all of the rooms. I replace furniture and paint every few years but it is now time for a major renovation which is why all January is blocked for this remodel. I am sorry they had such a bad visit and I still cannot figure out why my cell phone, home phone, email to myself or Homeaway failed. I will make certain from now on in that stay in better contact, I feel that after an initial visit or call, I do not want to bother guests so they can make the home their own. Again, when I called to check on them, and I spoke with them a few times, as well as the repair-man for the hot tub, they said all was well, so I was alarmed to read this review. Northeastern Pennsylvania borders the foot of the Catskill Mountains, and is a host to year round activities, including auctions, antiquing, shopping and museums. Activities in New York are also easily assessable. In the summer there is a host of outdoor activities such as fishing, rafting, canoeing, swimming, bicycling, horseback riding, golfing, hiking, country fairs, live theater, and concerts at Woodstock Concert's original 1975 performing site, known as Bethel Performing Arts Center. In the winter the area is transformed into a magical wonderland with some of the best skiing in the North East. When the fall comes, no one should miss the vibrant colors of a Pennsylvania Autumn or the chance to explore our vast wild life. For a quiet romantic getaway or vacation for the adventurous family, Pennsylvania has a lot to offer. Why not make it your next vacation destination? Rates are $550 for parties of 4 or under, $650 from 5 to 10. There is an additional charge of $100 per person for parties over 10 due to the septic system policy. Call for special rates for 2 guests.